This year, my first quarterly literary focus in english is IDENTITY. For me, it’s hard to believe that just an eight letter word has such as wide range of factors that heavily impact our lives. Identity touches our physical traits, personalities and even our cultural background, which all affect on how we are perceived in this world. Superficial or not, our image lead to how people judge us, our personality influences what they think, and cultural background can even affect our treatment in society. Funny thing is I started this blog to become a better writer and gain brevity, so I could be much prepared for the new world of college. For this post I am writing about my logo, which basically is my daily NDG Gear (minus my awesome beat headphones 🎧), and also my “digital” identity. It’s one of the first things people see on my social media and blog, so I thought I explain why I chose these objects to represent my myself online. As you can see my logo is basically a pair of glasses, a diary (or book), and bow tie. 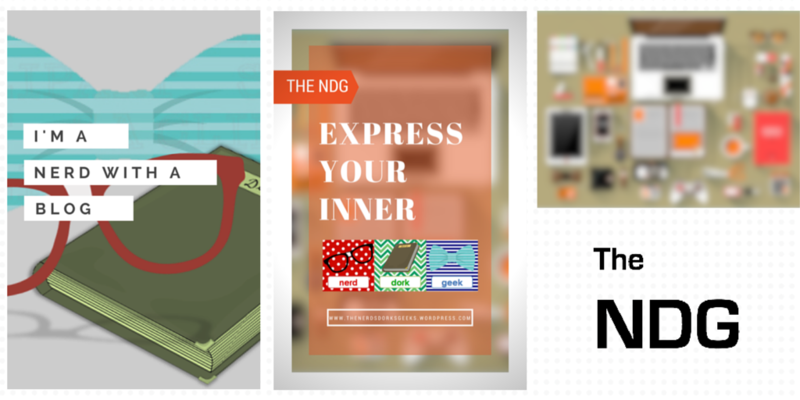 Each object not only represents one part of my blog title, “The NDG,” but also parts of my who I am, outside this blog. Recently, on CANVA (an amazing graphic design app) I created a few pins that really explain the meaning of each part of my logo much closely. Now honestly, I do not wear the bow tie or am a major bookworm (the book determines my obsession) but they to do relate to people and the experiences which have had a major affect on my life and identity. Unfortunately, just like our physical exterior, this does not summarize my persona or how far I want to blog to touch in who I truly am. I’m hoping that as I get used to blogging, I will be able to share more of my personal experiences and make this a community where I could meet with other people, who I usually wouldn’t meet, with similar fandoms or going through similar experiences or transformation. I honestly don’t know how if I’m ever going to share my cultural identity with any of you or go deeper than my logo rather than just stick with usual tips and fun blog posts. For sure, one thing I know is that this blog is my canvas and I’m definitely going to use it to express who I am. Presently online, I’m just a nerd with a blog, but I think I’m ready to expand the range on topics to much more than the regular school tips and TV show recaps. However, right now, I just want to say thanks to all the readers and followers who are going to part of my journey. Inspired by this amazing blog, Godmothers, Charmings, and Storytellers, I am also going to feature some casual cosplay posts from my pins of casual cosplay on Pinterest. In addition, my first YouTube video is on the way about What’s In My Backpack for school instead of the usual post. Lastly, there will be upcoming fandom posts about Bratz, Disney, Barbie and more ANIMES, plus technology as well. So please stay tune by following or reading up on my blog.